Poached Eggs & Ham with Porcini Mushroom Sauce… on a Bagel! It’s often said that breakfast is the most important meal of the day. Mostly, we agree with that statement, except on weekends, when brunch is the most important meal of the day. Go ahead and have your coffee whenever you roll out of bed, then take your time and whip up something special – like our recipe of the week, Poached Eggs & Ham with Porcini Mushroom Sauce on a Bagel. Why a bagel, you ask? Why not?! We like the firm, pleasantly chewy texture and yeasty flavor of bagels and find they they hold up well in this dish, even when covered with lots of mushroom sauce. But if you don’t like bagels, it’s not a problem; just use toasted English muffins or thick slices of your favorite bread instead. Don’t eat ham? Make a meatless version with thick slices of ripe tomato or avocado halves. To be honest, this hearty breakfast is mostly about the mushroom sauce, made with one of our favorite dried mushrooms, the fabulous, flavorful porcini. Porcini mushrooms (Boletus edulis) are one of the world’s great mushrooms. Highly esteemed since ancient times, the noble porcini was already part of an old, established culinary tradition when the celebrated Roman author and naturalist Pliny the Elder wrote about them nearly 2,000 years ago. He famously complained that the best porcini were served only at the “head table” at a banquet which he attended, while he and other guests were served lesser mushrooms. Considering the superior flavor and texture of the porcini, we have to take his side on this one. Like most other wild mushrooms, porcini have thus far resisted efforts to cultivate them and are still to be found only growing in the field and forest. With a short season of only a few weeks duration, fresh porcini simply aren’t available for much of the year. But that doesn’t mean that we have to go without! One of the best ways to preserve porcini for year-round use is by drying. It’s fortunate for mushroom lovers that porcini are one of the most well-suited mushrooms for drying and subsequent use after rehydration. Their marvelous flavor and aroma remain intact and are even intensified by the very act of drying. It’s no wonder that many traditional recipes are centered around the dried form of the estimable porcini mushroom. Dried porcini – and dried mushrooms in general – can be the cook’s best friend. Lightweight and easy to store (no refrigeration required!) 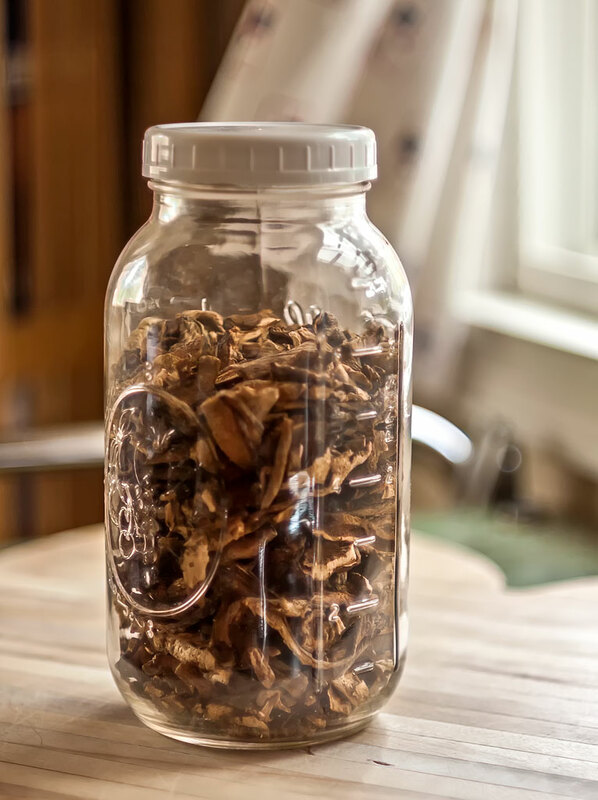 dried mushrooms are easy to keep on hand year round and are ready to use whenever you need them. While some people seem to be intimidated at the prospect of using dried mushrooms, they really shouldn’t be. Nothing could be simpler to use; a brief, 20-minute bath in warm (not boiling) water, followed by a quick rinse, and the mushrooms are ready to use in your favorite recipe. This hearty and satisfying dish is perfect for a between-the-holidays weekend brunch, especially for the morning after a late-night party. The tasty and versatile mushroom sauce makes an excellent topping for many other dishes, from meats, poultry and seafood to mashed potatoes and biscuits. Place the dried porcini mushrooms in a bowl and cover with very hot water. Allow to rehydrate for 20 – 30 minutes, or until soft and pliable. Strain the mushrooms, reserving the liquid. Rinse the mushrooms well under cool running water. Gently squeeze or pat dry, then chop coarsely and set aside. If desired, save the mushroom soaking liquid or “tea” for later use in soups or sauces. Heat the butter in a 1 ½-quart saucepan over low heat until melted. Add the chopped, reconstituted porcini and simmer for about 5 minutes, stirring with a spoon now and then. Whisk in the flour, salt and pepper. Cook over low heat, whisking constantly, until mixture is smooth and bubbly. Remove from heat and whisk in the milk. Heat to boiling, stirring constantly with a spoon for 1 minute. Keep warm. Slice each bagel in half and toast till golden. Place on plates and arrange 2 slices of ham on each bagel half. Poach the eggs by heating water (1 ½ to 2 inches deep) to almost boiling in a pan large enough to poach the eggs comfortably without crowding. Reduce the heat to a very low simmer with a few bubbles popping up here and there. Add 2 tablespoons cider or other vinegar. Break each egg into a custard cup; holding cup close to the water’s surface, slip one egg at a time into the water. Cook until desired doneness, 3-5 minutes. Spray some olive oil onto a slotted spoon, and gently lift each egg from the water, resting the spoon on a folded up paper towel to blot up as much water as possible. Carefully slip each egg onto a ham-topped bagel half. Ladle some of the warm sauce over each egg, sprinkle some Aleppo pepper or paprika and chives or green onions on top. Garnish with chive and/or borage blossoms, if using.